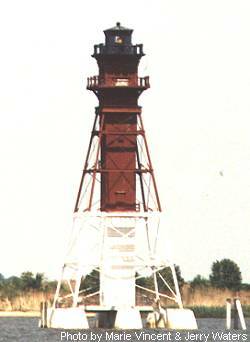 Craighill Channel Lower Range Rear Lighthouse – Chesapeake Chapter U.S.L.H.S. Craighill Channel Lower Range Light Rear (Miller’s Island) was originally to be a screwpile light. The lighthouse was constructed in 1873 on 9 granite piers with a pyramidal iron skeletal tower with square central cylinder with a fourth order Fresnel lens. It is a unique style for the Chesapeake Bay and is painted with a white base, a red top and a gray lantern. This lighthouse originally had integral keeper’s quarters built into its lower portion. The quarters were removed in the 1930s. This lighthouse is the tallest Maryland lighthouse. Located in the Bay and the entrance to the Patapsco River just east of Ramona Beach about 3 miles northeast of Fort Howard. Accessible only by boat. Views from Ramona Beach or from North Point State Park. Tower closed to public. Head Keepers: Henry Buckless (1873 – 1874), J.W. McDonald (1874 – 1887), Bernhard Berends (1887 – 1902), William K. Slacum (1902 – 1908), Harry H. Wills (1908 – 1923). Assistant Keepers: Uriah R. Nichols (1873 – 1874), Robert Williams (1874 – at least 1917), Robert Kuhn (at least 1919), William W. Bozman ( – 1921), Joseph D. Barnett (1921 – 1922), John M. Stowe (1922 – 1923).